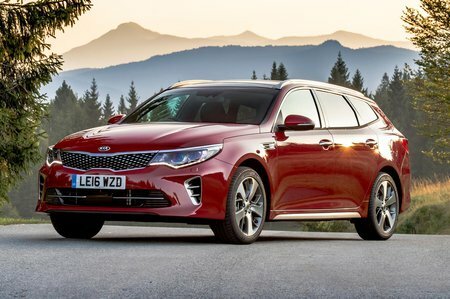 Kia Optima Sportswagon Performance, Engine, Ride, Handling | What Car? We’re yet to drive the 2.0-litre petrol engine, but the 1.6-litre diesel is generally fine for a car of this size. Sure, 134bhp looks modest next to an equivalent Superb or Mondeo, but while it’s not as quick as its rivals away from the lights, it’s flexible enough during normal driving, picking up smartly from around 2000rpm. The problem is that flexibility is short-lived: it runs out of puff by 4000rpm. On a cold start, it grumbles away, and it still sounds a bit strained even when warm – especially if you stretch it beyond the mid-range. Even though a Superb 2.0 TDI 150 isn’t whisper-quiet either, it’s less raucous than the Optima. The Optima's manual gearshift has a long throw, but it's light and fairly precise. The optional seven-speed dual-clutch automatic 'box is clunky at low speed, but once you're in the flow of things, it changes smoothly. But the Sportswagon isn't as engaging to drive as its rivals. Its steering is vague along the straight-ahead, before gaining weight suddenly and unnaturally as you turn the wheel. Both the Superb and Mondeo are less wallowy, steer more intuitively and, as a consequence, are easier to drive over a distance. Ride quality is more of a mixed bag. At low speeds across broken town roads, the Sportwagon can be a bit lumpy, but it works better on the motorway, feeling rather more settled and comfortable.